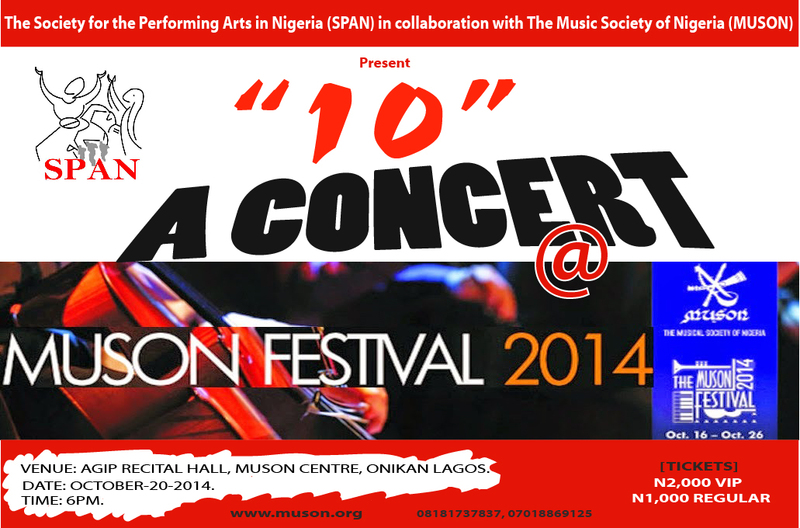 SPAN lights up the stage at MUSON Festival 2014! On the 20th of October 2014, The Society for the Performing Arts in Nigeria (SPAN) in collaboration with Music Society of Nigeria (MUSON) COMING OF AGE Festival 2014, will light up the stage in a dance concert titled “10“. “10” is a story that seek to showcase through the performing arts what SPAN is about. It promises to be mind-blowing and entertaining. Tickets are available and will be sold at the venue. VENUE: MUSON CENTRE, ONIKAN LAGOS.